The peacekeeping mission of the United Nations in Haiti is a creature that is used to constant change. The newest of which is the appointment of a new head for the operation, Sandra Honore, who took up her post recently. 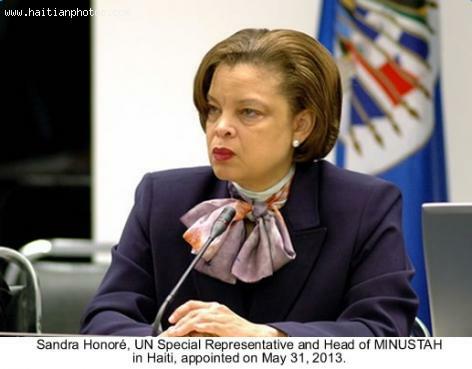 The title is that of Head of the United Nations Stabilization Mission (MINUSTAH) as well as the UN's Special Representative to Ban Ki-moon, the United Nations Secretary General and her appointment was made at the end of May, 2013. The mission had its start in Haiti back in 2004 after embattled former Haitian President, Jean-Bertrand Aristide was unseated in a violent coup that greatly upset the stability of the nation. Honore, from Trinidad and Tobago, has, since 1979, been working as a diplomat as well as doing work as an Ambassador to Costa Rica until August of 2012. In the middle of the 90's, she worked on an electoral observation mission in Haiti with the OAS as the Special Assistant to the Chief. She also worked for the Organization of American States' Assistant Secretary General, and was the Director of CARICOM (Caribbean Community) and the Caribbean Affairs Division. She graduated from two French Universities, and holds diplomas from the University of the West Indies (Trinidad and Tobago) and the Polytechnic of Central London. She takes over the role formerly held by Mariano Fernandez, who supposedly retired from the post at the start of the year in favor of a political career.